Hey Kids! It's your Very Own Grease-Absorbent Krustyburger Souvenir Fun-Mat! 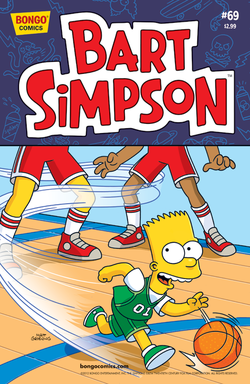 Bart Simpson #69 is the 69th issue of Bart Simpson, released in March 21, 2012. 1.3 ...Bart Simpson Shall Do My Bidding! 1.4 Hey Kids! It's your Very Own Grease-Absorbent Krustyburger Souvenir Fun-Mat! Mr. Burns brings a professional women's basketball team to Springfield, turning them from losers into winners. Lisa soon discovers the reason behind this surprising transformation. When Homer's car won't start, Maggie goes into action. Main article: ...Bart Simpson Shall Do My Bidding! Sideshow Bob hypnotizes Bart as part of a plan set to humiliate him, however, as per usual, Bart out does Bob once again. Main article: Hey Kids! It's your Very Own Grease-Absorbent Krustyburger Souvenir Fun-Mat!